Chhattisgarh is located in the central part of India. It is the 10th largest state of India. Raipur is the capital of Chhattisgarh which is the main center of higher education. Their are many famous government & private institutions located in the state like National Institute of Technology (NIT) and many others. The literacy rate of Chhattisgarh state is around 71.04%, as per the census report of 2011. 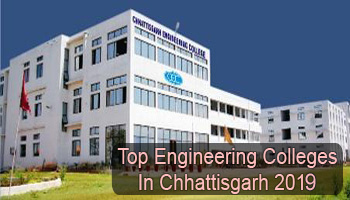 In this article, we have listed the top engineering colleges in Chhattisgarh 2019. At Sarvgyan.com, we have mentioned a list of top engineering colleges in Chhattisgarh 2019. This list comprises of top engineering colleges like NIT, Raipur & other government & private colleges/universities of Chhattisgarh state. We have gathered the information from different sources while rating the various engineering colleges. We have rated the universities and colleges on the basis of various factors like academic excellence, placement status, student preference, quality education, college affiliation & accreditation, college infrastructure & facilities, national importance & many other factors. On considering all these factors, we have rated these colleges. The admission will be provided in Chhattisgarh through national level exam (JEE Main) and state level exam (CG PET). Students can get admission in B.Tech course through any one of them. JEE Main will be conducted by the NTA. The application form will be released through the website. Students can appear in the GATE examination regulated by IITs for admission in the M.Tech programme. Various colleges & institutions of Chhattisgarh state offer different specializations in engineering courses. Some of the trending specializations are Mining Engineering, Computer Science and Engineering, Civil Engineering, Mechanical Engineering, Electronics and Communication Engineering, Electrical Engineering, etc. If you have any other queries about Top Engineering Colleges in Chhattisgarh 2019, you can leave your queries below in the comment box. what position does KEC Bhilai acquire in CG?